Hi, sorry for my poor level in english, I am writing from France. I am very happy and I would like to thank simply speaker company. Repair videos are very usefull and gave me confidence in the fact I could repair the speakers myself. The shipping was perfect and the delay 10 days between ordering and delivery, which is short between USA and France. I do recommend simply speaker's. Product perfect even if you are not a specialist. 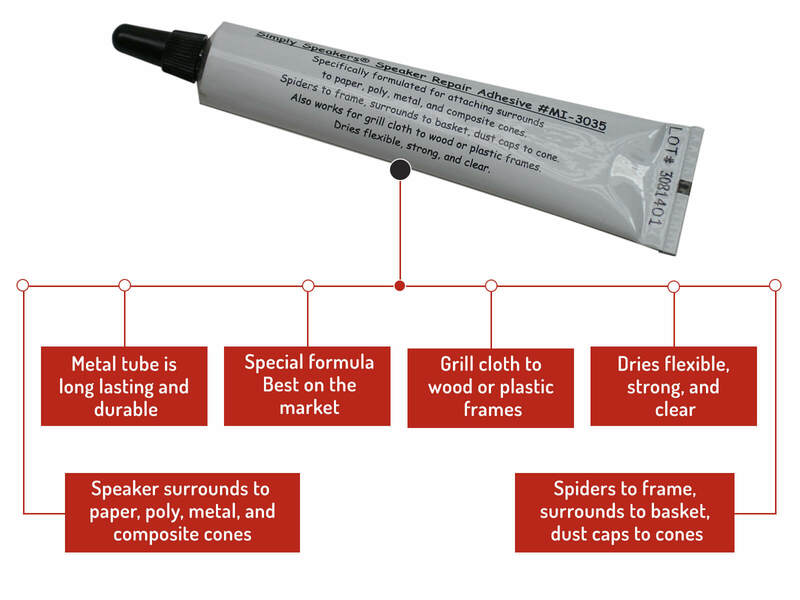 The glue is fantastic to use. Second time I use Simplyspeakers product, very happy with. only one concerns the cost of shipment to France for small quantities. First time I ever tried this type of repair and it went great. Easy to follow directions and plenty of help from the staff at Simply Speakers. My Allison 120's sound as good as ever. My Allison speakers are 30 years old. The foam kit was easy to fit and has completely fixed the sound from the speakers. They are as good as new again. Thank you Simply Speakers ! I was a little apprehensive about doing this myself, but after watching the video I went ahead and started and it was as simple as they made it look on the video. It may have been easier for me since I do many types of projects with my hands. The results were great. I have my Allisons back and they sound as great as ever. It was funny. A client of mine upgraded his gear and offered me the old amp and speakers. I needed a set for my garage so I took the gear. After I hooked them up realized there was an issue as they sounded like crap. The speaker gaskets had disintegrated and assumed they were garbage. 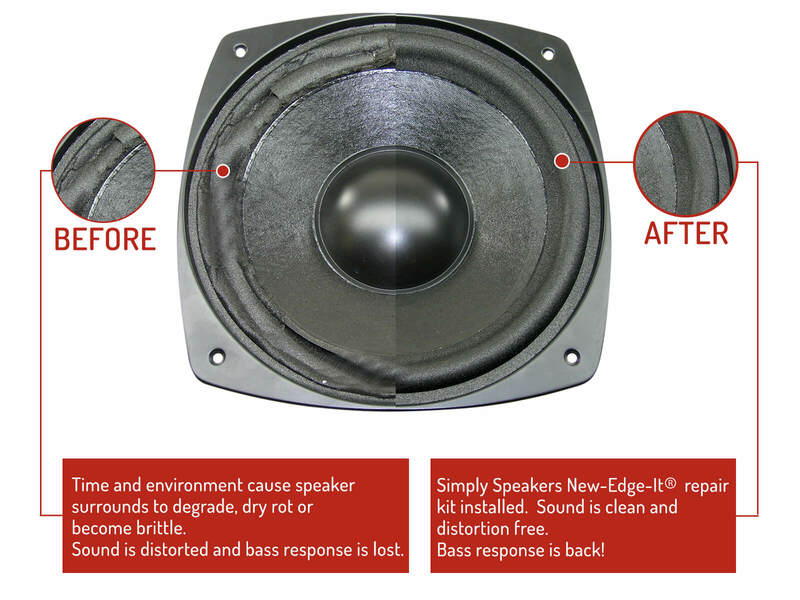 I found Simply Speakers repair kit and thought...Hmmm. I decided to go for it and with minimal effort and $25 I've got a thumpin set of restored Allison speakers! It works! Kit was easy to use, repair done, speakers saved! The kit was for a pair of Allison CD 7s dating from the 1980s. They sounded amazingly good considering their age and mostly rotten and missing foam. I watched the YouTube video how to replace the foam rings, ordered the kit which arrived promptly and followed directions. The adhesive worked as described and all went well. The whole job, not including the wait time for the adhesive to set up, took less than two hours. Now the speakers sound even better at the low end because the speaker cone "pistons" are functioning more efficiently. Thanks for a great kit with great instructions. It was a good value. Easy to use and no problem with replacement. Q: I have Allison CD-6 bookshelf speakers that have been in a box for years and years. How do I tell if they are worth foam speaker repair, etc.? A: If the other components are working (tweeter, crossover) and the cabinets are in good shape, then they are worth the investment in refoaming. A: Yes, this is the correct foam replacement kit for the Allison Four woofers. Q: These look like they will fit my Allison CD6 bookshelf speakers. Is that correct? Thanks. A: Yes, correct! 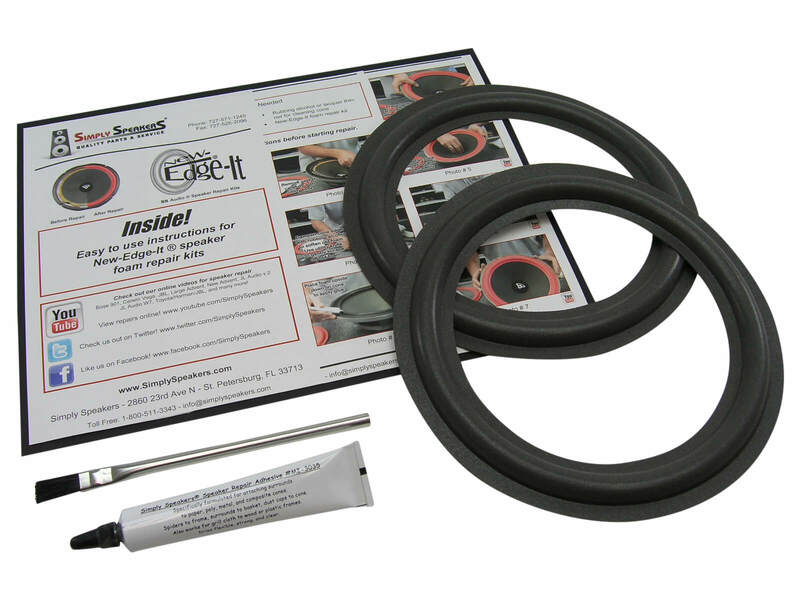 This foam replacement kit fits the Allison CD6 woofers. Q: I need surrounds for Allison AL-115, will these work? If not do you have some that will? A: Yes, this kit fits the woofers in the Allison model AL-115. We also sell the 6.5" kit (if needed). Thanks! Q: 1) Will this kit fit model CD-8 by Allison. 2) Are the foam rings manufactured in the USA? A: 1. Yes, this is the correct kit for the Allison CD-8. 2. Yes, all of our foam repair kits are made in the USA. Q: Is this the correct kit for the RDL F-1's? They were also Roy Allison speakers, and have an 8 in upward firing woofer as well. Thanks. A: Thank you. Yes! this kit will fit any Allison design 8" woofers with a 6" cone and 8.25" frame diameter. Allison: 2, 4, Four, 5, 6, 7, 110, 130, A-4, A4, AL-130, AL130, Cube 6, CD-6, CD6, CD-7, CD6, CD-8, CD8, LC-110, LC110, LC-120, LC120, and many more!